Central London office transactions in February 2014 reached 802,000 sq ft in 35 deals of 5,000 sq ft of more. Two deals dominated the month: EY taking 205,000 sq ft at 25 Churchill Place and ING Barings taking a 120,000 sq ft pre-let at the nearly complete 8-10 Moorgate in London, EC2. 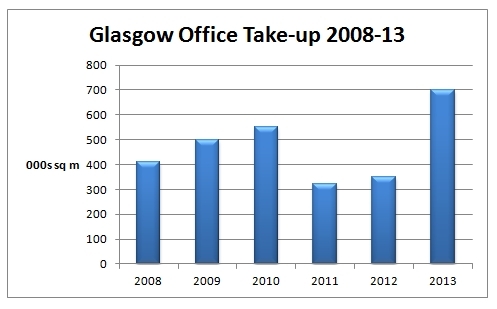 Deals for Grade A space dominated during February, with 600,000 sq ft of the 800,000 sq ft signed on new office space. Professional and Financial sectors dominated as a result of the EY and ING deals, but there were also significant lettings to the TMT (technology, media and telecom) sectors. The City and Docklands dominated lettings with over 80% of transactions coming in these areas. Metropolis has noticed an upswing in the number of university building projects, being planned and tendered for over the last 2 years months. During the years 2012 and 2013 over 260 higher education projects have been reported by Metropolis each year, compared to less than 200 each year in 2010 and 2011. In the past year, the volume of new space being planned has topped 600,000 sq m (6.5m sq ft) and the early indication from planning applications in early 2014 is that new floorspace being planned could rise further in 2014. Recent examples include the University of Edinburgh’s £20m Old College Building refurbishment for the School of Law; a £29m medical centre at University of Surrey; a £42m Centre for Medicine at Leicester University; a £20m Far-Eastern centre for Oxford University and a £41m biotechnology building at Cambridge University, plus new law schools at Leeds and Manchester. Government reports suggest that current high student numbers, combined with a change in methods of teaching learning and research are leading to a re-appriasal of facilities. New capital projects are being targeted to specific university objectives which will lead to a better profile for the university and the chance to increase investment returns. In parallel, universities need to attract higher income overseas students, so aim to build better high-end accommodation and recreational facilities, as well as launching new landmark schools of law or medicine. Non-residential income at institutions has risen by nearly 11% in recent years, while the proportion spent on maintenance has fallen by a similar amount. So while income per student has been rising, the amount spent accommodating and teaching each student has been falling, freeing up more potential for capital investment. 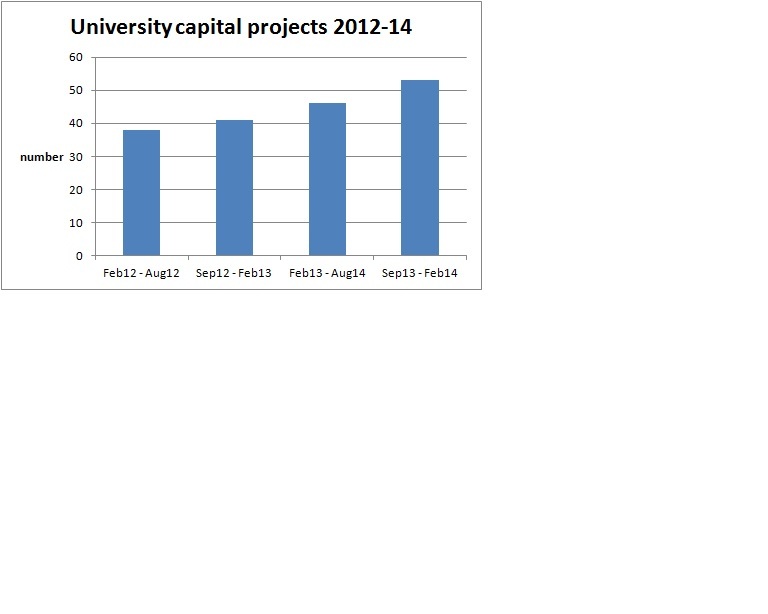 As the examples above illustrate, plans for new higher education capital projects in the last two years are growing in number. Current plans reflect a clustering of schemes at Oxford, Cambridge and Edinburgh, as well as a surge of activity in the south west region. In some regions the higher education sector has become a main plank of some architect’s workloads. Figures from Metropolis show that number of higher education projects seeking tenders each month, has doubled in the last 6 months. The outlook, based on the current planning pipeline, is for this increase to be maintained into 2015.